A lot of programs need to be used simultaneously, which potentially multiplies sources for problems if everything is not set up correctly. Moreover, there is only so much automation you can achieve with so many programs doing different things, although the level of automation can be good given that everything communicates together through ASCOM. 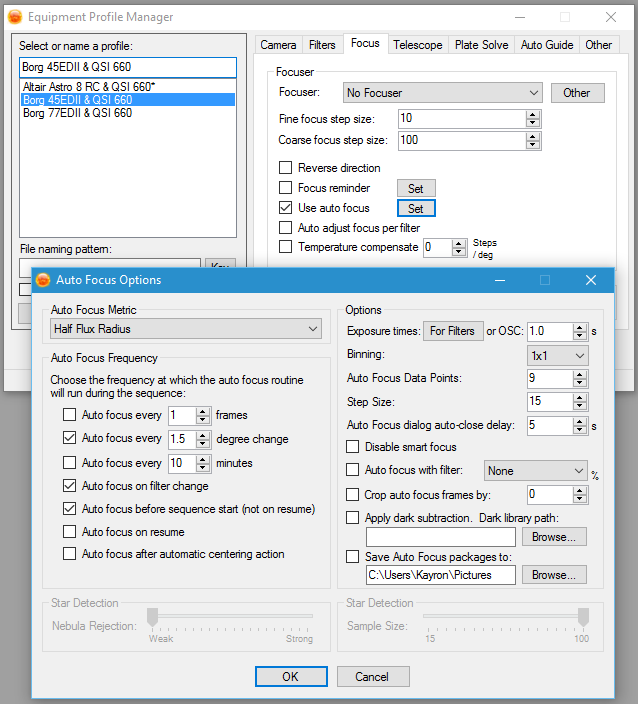 Auto-focusing is popularly done through the program FocusMax, which unfortunately requires you are using MaxIm DL or CCDSoft for image capture. This brings us to Sequence Generator Pro, a program I later bought into. The main program costs $99 but there is an amazing addon for framing targets and producing mosaics that costs an extra $39. That is a sum total of $138 for a program that advertises to do absolutely everything in a wonderfully automated manner. ​The user interface is certainly more modern and less cluttered than MaxIm DL, plus the total price is about 23% of MaxIm DL's. The developers created Sequence Generator Pro after having used much of the software I listed at the top of this post, and noting they would have liked certain features and certain automation they lacked. Moreover, their philosophy is not to over-price their software as us astrophotographers have enough expenses when it comes to actual equipment. All this bodes well for Sequence Generator Pro in my view, particularly since the developers used to use PHD Guiding and PHD2 with Nebulosity and decided that good as they are, they wanted more. 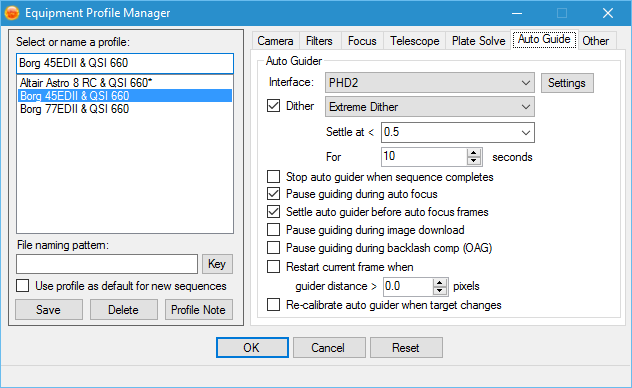 ​Sequence Generator Pro does not currently (as of version 2.6.0.7 Beta) have its own embedded autoguiding system and instead depends on the user using another program for it, such as PHD2. Other programs are also supported in any case. What Sequence Generator Pro does also not currently do is polar align or drift align your mount, though you could probably conjure up a routine to drift align with it. Mind you, these are not show-stoppers for me. I am perfectly happy to run EQMod to polar align and then PHD2 to drift align before starting Sequence Generator Pro to do all my imaging, with PHD2 running in the background for the autoguiding. 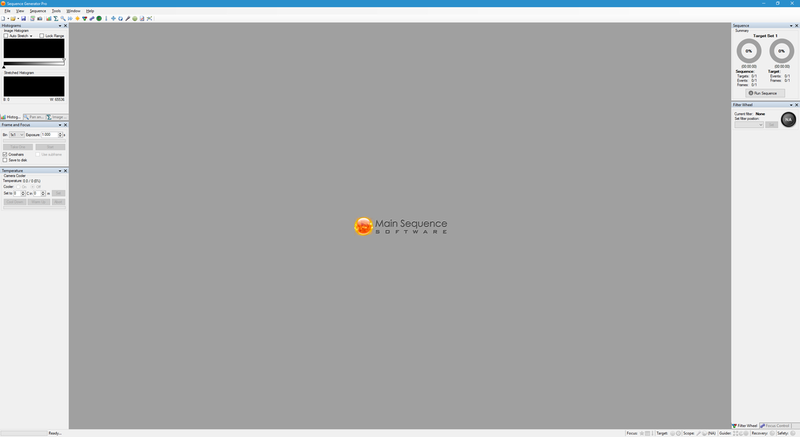 A very prominent feature of Sequence Generator Pro is its ability to plate solve to centre your targets precisely. This can be done via a number of external options (as it lacks its own system to do this). Elbrus is free but very fiddly to get installed correctly. Pinpoint costs around $150 and is easier to install but people have mixed feelings as to how well it performs. Then comes Astrometry.net. This one is free but requires an Internet connection as it uploads the image, has it plate solved and retrieves the results. 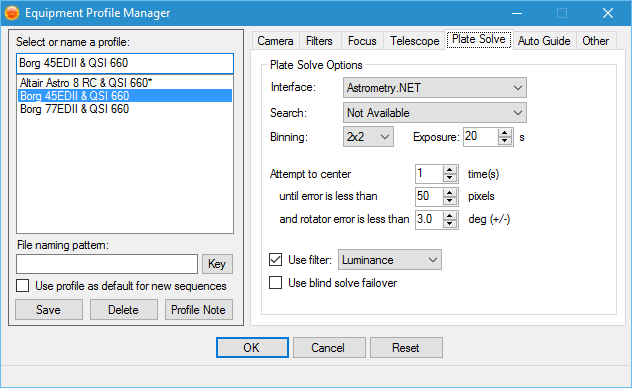 The great thing about Astrometry.net is that it can do a blind solve, which requires no information as to the image scale or rough area of the night sky. Good news for those of us who image outdoors without an active Internet connection is that you can actually install a local Astrometry.net service on your computer that contains the actual plate solver plus all the astrometric index files needed for successfully plate solving all your images. Those of us who have used AstroTortilla before will note its great similarities and the reason for this is simple - AstroTortilla actually uses a local Astrometry.net service as well. 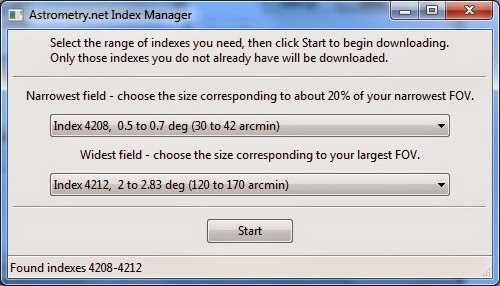 Therefore, Step 1 on my tutorial on installing and setting up AstroTortilla is perfectly relevant here once you open the Index Downloader used to download the astrometric index files for your local Astrometry.net service. 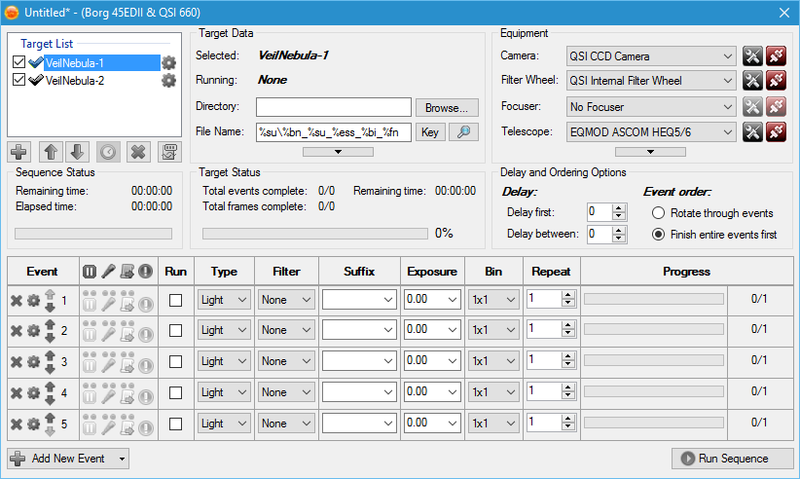 The above are my personal settings for allowing me to use this local Astrometry.net service with my current Altair Astro 8" RC and Takahashi FSQ-85ED ​telescopes with my QSI 660wsg-8 CCD camera. 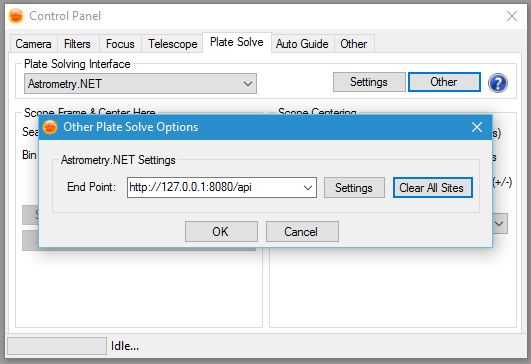 The service, called ansvr, can be configured for optimum settings, just like AstroTortilla. Above, you will notice I have the sort the star brightnesses option enabled. This is AstroTortilla's equivalent of the -r parameter, which sorts the detected stars in order of brightness (brightest first). Under Objects, I have entered 100. This instructs ansvr to only compare the first 100 stars detected and since they are already sorted in brightest first, it essentially cuts down on the processing by comparing the 100 brightest stars detected. 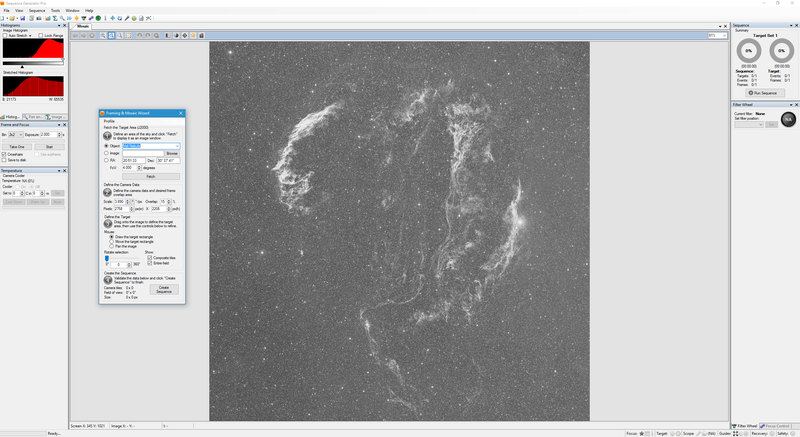 I have nothing under Downsample factor because of my Sequence Generator Pro settings for Plate Solve - I set it to Bin 2x2, which already effectively downsamples, with the added benefit of a brighter image with more detectable stars. If you are using a DSLR, since binning is not possible, you may wish to enter 2 in Downsample factor, to reduce the dimensions of the image used in plate solving by a factor of a half, making the processing faster. Please note that Sequence Generator Pro parses the scale parameter to ansvr when plate solving commences. This tells ansvr the range of field of view values to use in analysis, depending solely on your Sequence Generator Pro equipment profile's Scale under Camera (in arcseconds/pixel) - see below. 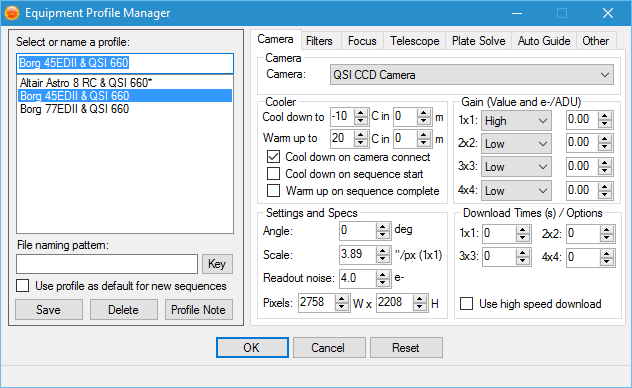 This means that if you change telescope or camera and load up a different profile as a result, Sequence Generator Pro will already tell ansvr the correct field of view range to analyse. Also note that the unit of the parsed parameter is arseconds/pixel, rather than AstroTortilla's default degrees unit. 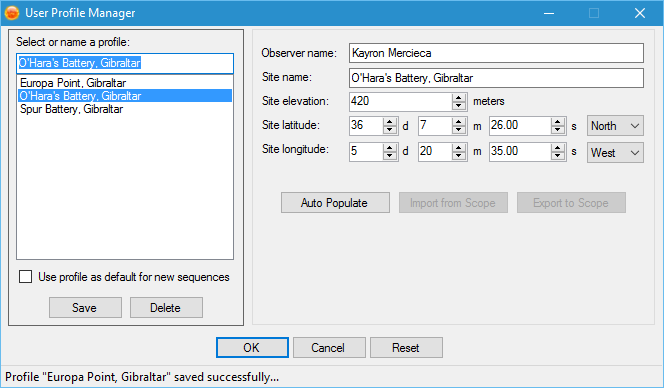 The only thing one needs to do to tell Sequence Generator Pro to access the local Astrometry.net service rather than the online one, is to enter the local computer's IP address with the correct port number (the port number is chosen during installation) in the Other settings for Plate Solve in Sequence Generator Pro's Control Panel. 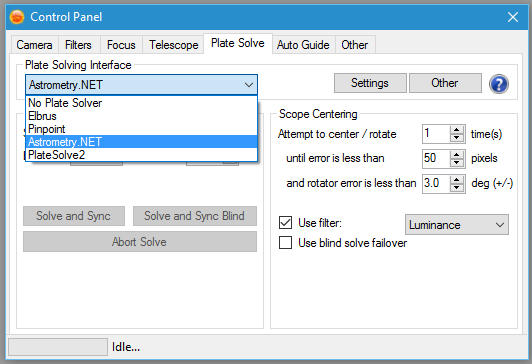 One should also select Astrometry.NET from the plate solver list. 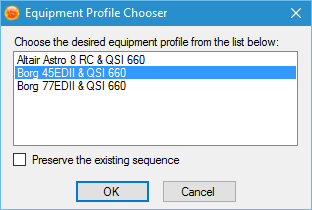 ​Since Sequence Generator Pro requires information about your equipment, it allows you to save equipment profiles. 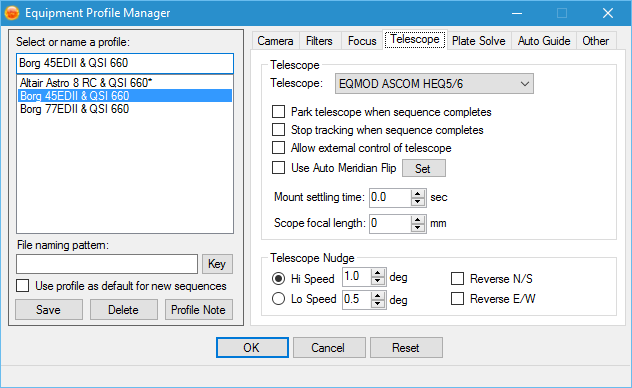 These can then be loaded up quickly to tell Sequence Generator Pro you have switched telescope, or camera, or mount, etc. Once a profile is set up, all features of the program will pick up the relevant data and equipment, saving time and having to remember specific values. ​A user profile can also be set up to essentially provide location coordinates for the imaging site being used. Once a user profile and equipment profiles are set up, one can create a sequence based on an equipment profile. We now inspect the excellent addon that I bought separately for an extra $39 - the Framing & Mosaic Wizard. This picks up the data from the active equipment profile in order to facilitate the configuration. ​All one need do here is define a target, a desired field of view around the target and Fetch the data. 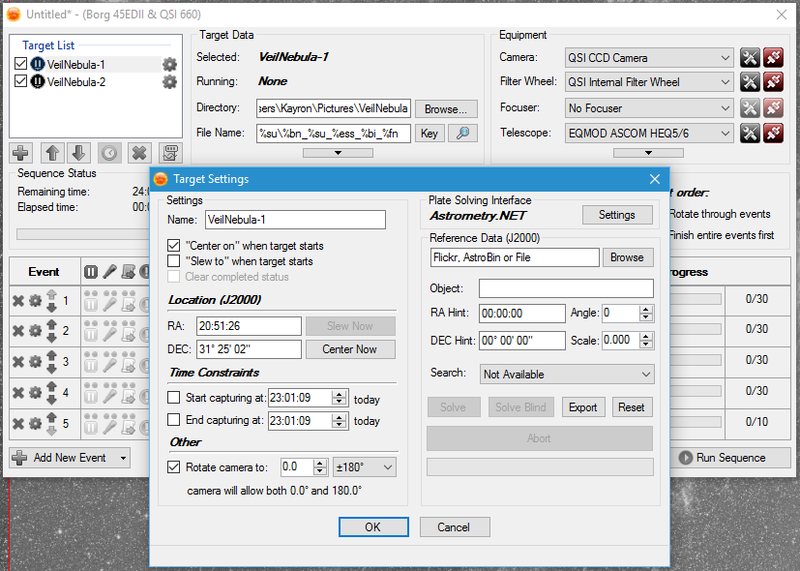 The camera data is pulled directly from the equipment profile, making this a much easier process. This wizard is an incredibly powerful feature of Sequence Generator Pro, and is worth its weight in gold. Though requiring an active Internet connection while using it, you can input a Flickr or AstroBin website address to a plate-solved image and it will automatically pick up that region of the night sky. Either that or a catalogue number or common object name. When you Fetch, it downloads an image from the online SIMBAD database for that area of the night sky with the field of view set. One can now drag to create an imaging plan around the object in view. It can be a single panel or multi-panel if a mosaic is desired (with the set percentage overlap). An angle of rotation can also be defined, which not only rotates the SIMBAD-provided image but it also controls your camera rotator, if you have one connected. ​Once happy with the framing, you can ask it to Create Sequence and it generates a list of targets in the sequencer automatically. 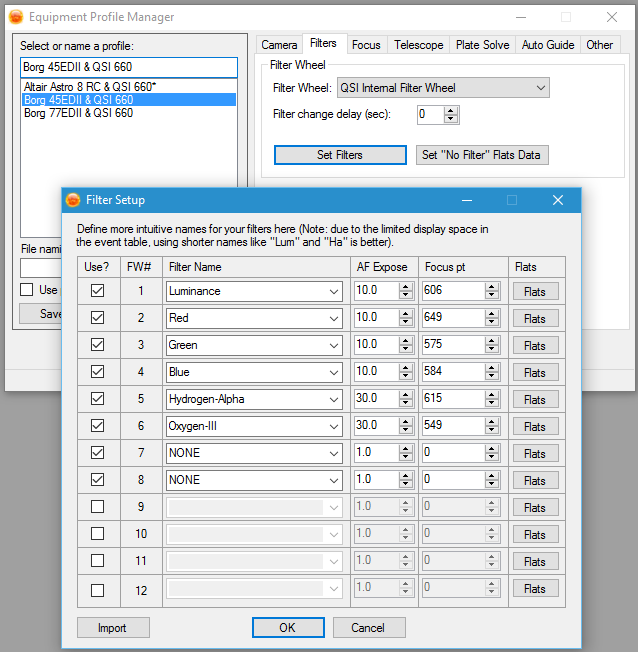 ​Here we can set a sequence of filters and an overall imaging plan, which we can copy over to the other segments listed in the Target List. We can also set the image download path and a format for their filenames as they are downloaded. At this point one can save the sequence created and load it up when prepared to image. Even if you have no active Internet connection where you are, loading the sequence file created has everything already set up with the location coordinates of your target, the target list, the imaging plan, etc. The only thing the user needs to control beyond the actually running of the sequence is the autoguiding with the likes of PHD2, for example (after having polar aligned and perhaps drift aligned, of course). 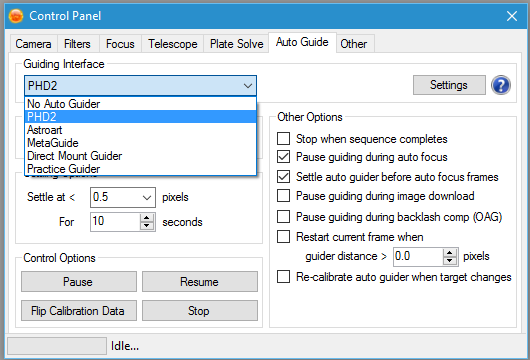 Autofocusing is handled very effectively through Sequence Generator Pro's embedded system. Overall, for $138, Sequence Generator Pro seems very much well-worth it. Give it a shot if you are interested - you can use it on a fully-featured 45-day trial before deciding if to keep the free Lite version or buy the Pro version.